Most leg ulcers can be cured using varicose vein surgery. This means that patients do not need dressings and long-term compression. Prof Mark Whiteley has published an article explaining this. The article appears in the journal “Wounds UK”. 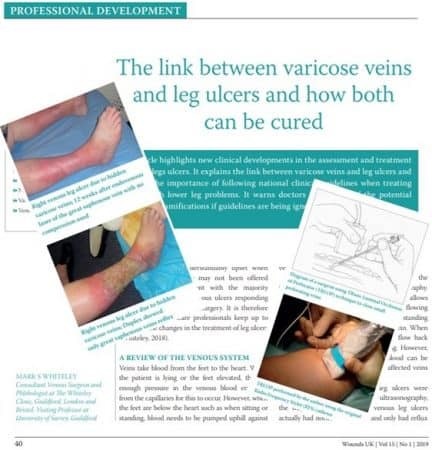 The title of the article is: “The Link between Varicose Veins and Leg Ulcers and How Both can be Cured“. Most people in the UK with leg ulcers have venous leg ulcers. This means that they have varicose veins or “hidden varicose veins” causing the ulcer. Varicose veins and “hidden varicose veins” are caused by “venous reflux”. This is the name given to blood falling the wrong way down a vein. In normal veins, the valves stop this from happening. In people with varicose veins or hidden varicose veins, the valves have failed. This allows blood to fall down the veins causing inflammation at the ankle. This is explained in the book: “Understanding Venous Reflux – the cause of Varicose Veins and Venous Leg Ulcers”. If the varicose veins and “hidden varicose veins” are left without treatment, they cause increasing amounts of inflammation at the ankles. In time this causes the ankles to swell, turn red, turn brown and eventually form leg ulcers. There are other causes of ulcers such as deep vein obstruction, arterial disease (vascular disease) and diabetes. However, all of these are much less common than simple venous ulcers due to varicose veins and “hidden varicose veins”. At the present time, most venous leg ulcers are treated by compression. Dressings are put over the ulcer itself. A compression bandage or stocking is then placed around the lower leg. This compression works by increasing the pressure on the skin. This, in turn, reduces the venous reflux and allows the ulcer to temporarily heal. However, when the compression is relieved, the ulcer just comes back again. This is because compression doesn’t actually do anything to the underlying vein problem. Therefore, although this is the current treatment, it is clearly illogical and should be consigned to the history books. How should leg ulcers be treated? Anyone who has had a leg ulcer, even if it is healed, should be referred to a specialist centre for a venous duplex ultrasound. This is not only an opinion but is now part of the NICE national guidelines. A venous duplex ultrasound scan performed by a specialist will identify the underlying cause. In the majority of cases, this is venous reflux. Venous reflux causes “varicose veins” or “hidden varicose veins”. Since March 1999 when Prof Mark Whiteley introduced endovenous surgery into the UK, varicose veins or “hidden varicose veins” can be treated by pinhole surgery. Nowadays this is performed under local anaesthetic as a walk-in, walk-out procedure. The new endovenous surgery is now the recommended first-line treatment by the NICE clinical guidelines (NICE CG168). If the NHS and private insurance companies followed these guidelines in the UK, it would save between £2-3 billion per year in leg ulcer dressings that would not be needed. 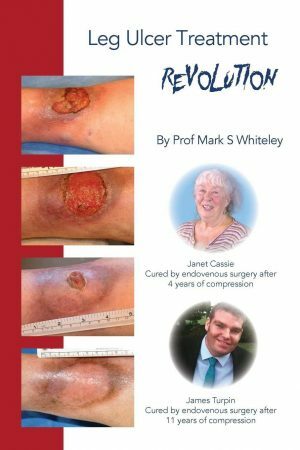 This is explained in the Wounds UK article and also in the book “Leg Ulcer Treatment Revolution“. What is the long term success rate for healing venous ulcers? Using The Whiteley Protocol, we have published our long-term results. 85% of our patients were completely healed in the long term. What is The Whiteley Protocol? The Whiteley Clinic uses a unique system of investigating and treating patients. Unlike most vascular (arterial) surgeons or simple vein clinics, we check the superficial veins, deep veins, perforating veins and pelvic veins if needed using a team of specialist vascular technologists. Our team of consultants then use these results to tailor treatment to the specific patient. We use a variety of techniques as needed. Some of these are used by other clinics such as endovenous laser, radiofrequency and foam sclerotherapy. However, others are quite specific to specialist centres such as The Whiteley Clinic such as TRLOP closure of perforators and pelvic vein embolisation. The way that we put the stages together from diagnosis to full treatment is unique to our clinic.